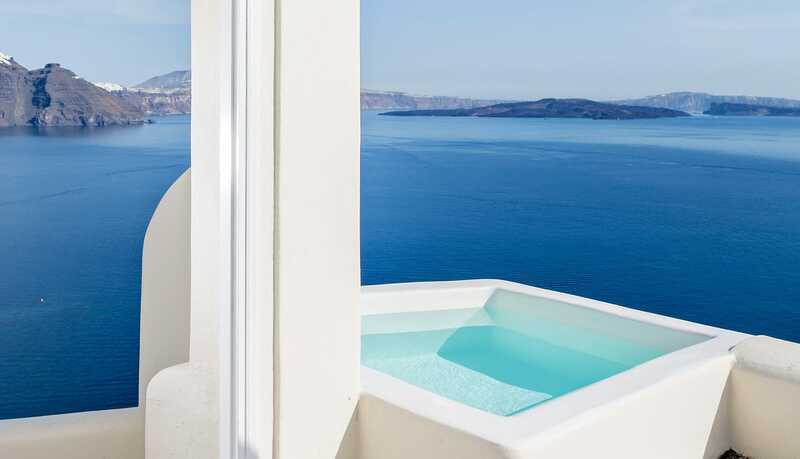 One of Santorini’s most iconic properties, Canaves Oia Suites is a luxury property with stunning suites, many complete with their own private pools. The property was the traditional winery in the 17th century and can be found carved into the cliff face. 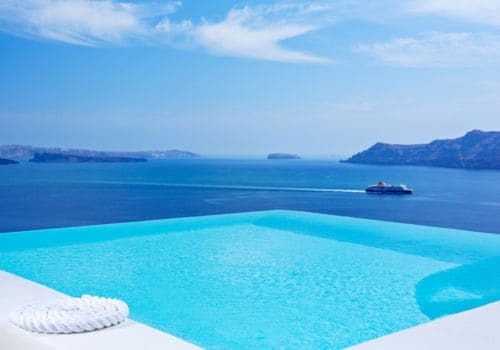 Santorini architecture is synonymous with this property and you’ll find a minimalist design, large open spaces and private plunge pools with beautiful views directly into the Aegean Sea and the famous Caldera. 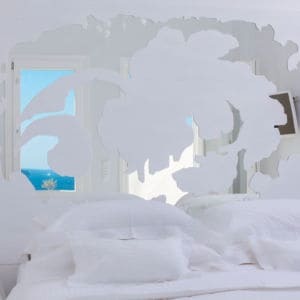 The Junior Suites at Canaves Oia include a wonderful open plan bedroom complete with its own King Size bed and living area as well as a large bathroom with monsoon rain shower. The private terrace has a plunge pool jacuzzi as well as space for open-air dining – ideal for starlit dinners. 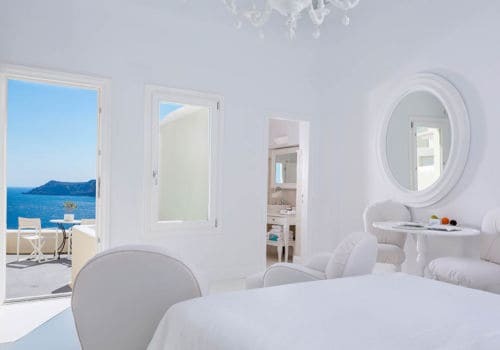 The Superior Suites at Canaves Oia are traditionally white. With an open plan bedroom complete with a King Size bed, you’ll also find a spacious living area as well as a large bathroom with its own monsoon shower. On the private veranda you can enjoy your own plunge pool jacuzzi. 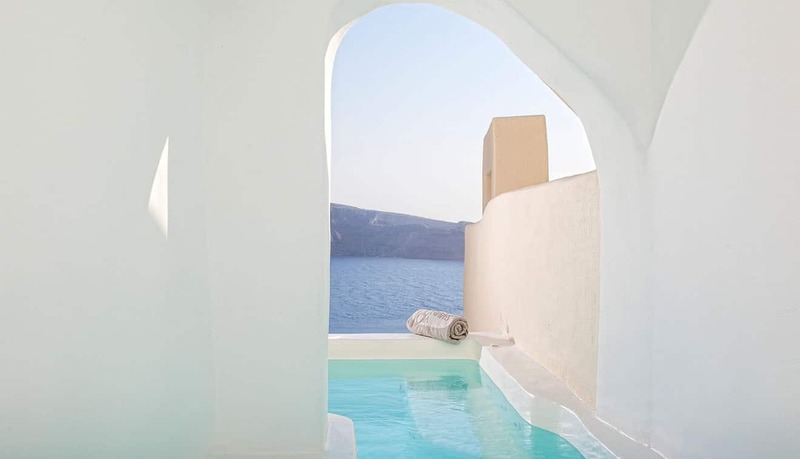 The Honeymoon Suite at Canaves Oia is perfect to celebrate your wedding. 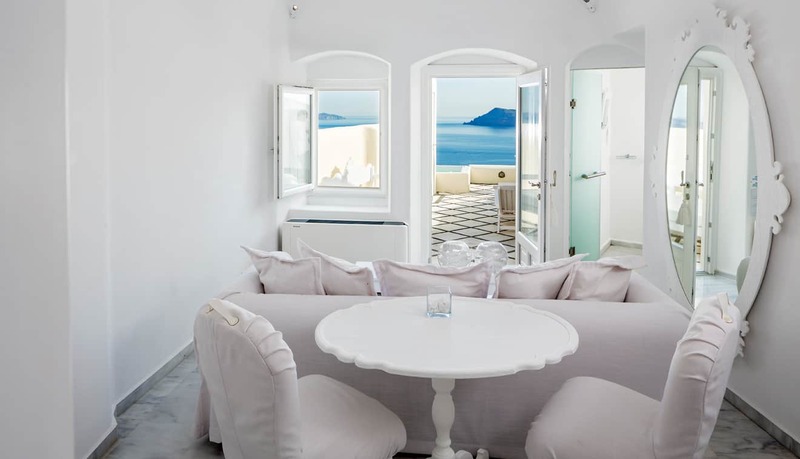 One of the best suites in Santorini, it’s at the highest and most private level of the development and has incredible views of the Aegean Sea and Caldera. Your private infinity plunge pool is beautiful and the open air terrace means dinner under the stars is a must. The room type most instantly recognisable at Canaves Oia is the River Pool Suite. The unique river plunge jacuzzi makes this room one of a kind. The open plan bedroom and king size bed leads onto a spacious living room. The bathroom has its own monsoon rain shower and bathtub and a walk-in wardrobe. 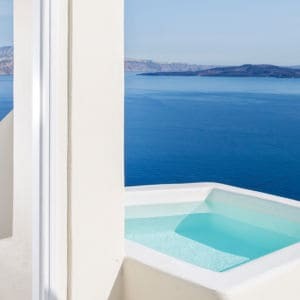 With stunning panoramic views of the Caldera and the Aegean Sea, the Infinity Pool Suite includes your very own private infinity pool. The separate bedroom and living room are augmented by a large bathroom with rain shower. Enjoy dinner under the stars in your beautiful private suite. The Canaves Suite with its own private pool has two bedrooms. The beautiful master bedroom with a King Size bed is set in a loft in the property whilst a further bedroom is on the lower level alongside the living room and dining area. There is a sauna as well as a plunge pool and the suite accommodates up to five people. 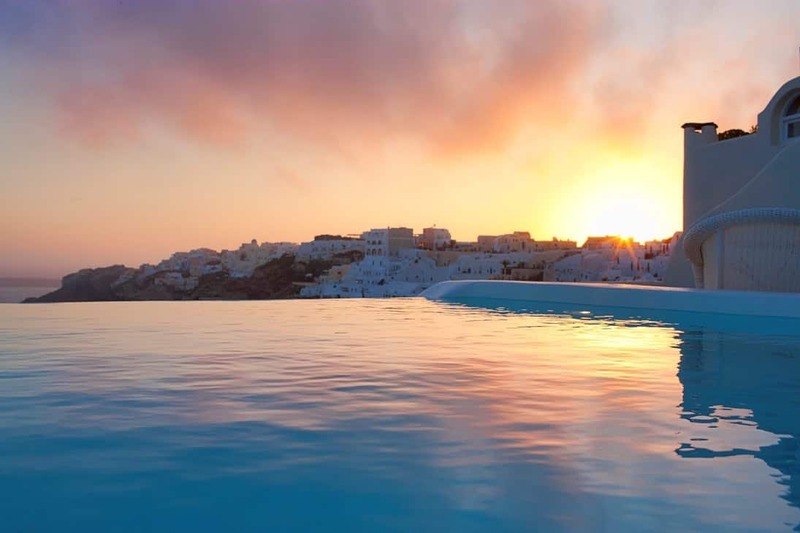 Canaves Oia boasts the most romantic accommodation on the island, situated in the small village of Oia. Relax in your own private plunge pool and finish the day in style with wine tasting, enjoying the fantastic Mediterranean cuisine. The infinity poolside bar and restaurant has a relaxed dining experience and is great for cocktails while watching the sunset over the Mediterranean sea. Guests have access to the Canaves Spa at the hotel, and can enjoy Elemis treatments and personal robes can be found in each suite. For dining, you’ll enjoy the mouth-watering menu at the Petra Restaurant where you’ll find healthy and beautiful Greek/Med-inspired dishes.